Saving money can be hard for many people. Most of them thinks that saving is only for those with high income or they need an increase before they start saving. This should not be the right attitude towards saving. It does not matter how much you earn but actually it should be how much you spend. Here are some simple tips on how you can save from your daily or monthly expenses. When buying some stuffs, think first if it is something that will be useful for you or a necessity. There are lot of things you can see in the market that is really nice to have but not necessary. Even you find some items on sale in a store, think twice before buying anything. Yes, you might have save some because the item is discounted but you could rather spend it on your other needs. Do not over spend! Avoid fees such as late charges or interest. You can schedule automatic repayments from you bank account or through the services from you credit card. If you missed a deadline for a day, call their customer support they might wave the charges if you are a preferred client. Rather paying individually for different services, you may want to check the bundled services your local provider can offer. You can bundle your internet, cable tv or your phone. Check the best offer in the market. When travelling to near places, you may want to consider walking or grab your bike rather thank taking your car. Not only you can save from your gasoline expense but with parking fees as well. In this digital era, you can actually sell your things in the internet. eBay is one popular platform for this. In the Philippines we have OLX. It is easy and you can earn extra from it. Cut your daily food expenses by 20-50% through home cooked meals. Reduce eating out since it can be too pricey and unhealthy. 7. Buy grocery (non-perishable) items in bulk. There are lot of generic brands in the market. It is cheaper but can offer the same quality of the product. Ask assistance from the store crew - they can suggest alternative brands. Instead of getting services outsourced, set some time to do it yourself. Services such as laundry, cleaning, etc. Hey some are just easy to do you just need to squeeze it from your schedule. 10. Reduce Electric, Water and Phone Bill. Turn-off and unplug appliances when not used. Downgrade your phone plan if you are not maximizing the availed services. 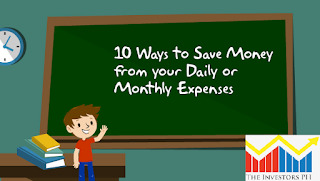 Mostly people look for ways to cut expenses that are easy to implement as well effective for minimize the damage caused on a monthly basis. The edubirdie reviews and all the 10 ways are incredible here to save money that anyone can try one by one without too much effort.